One of the things that can be said for Gail’s writing is that she often knows how to subvert tropes and spin them into something that you can really connect with, on a whole different level. That’s what she does here in this issue. All the heart-pumping action aside, what she stresses in this issue is that the Hyborean Age is not a setting where the women are weak and unable to get their justice on their own. For Annisia, she seeks justice for her experiences in the pit that King Dimath freed her and Sonja from ages ago. 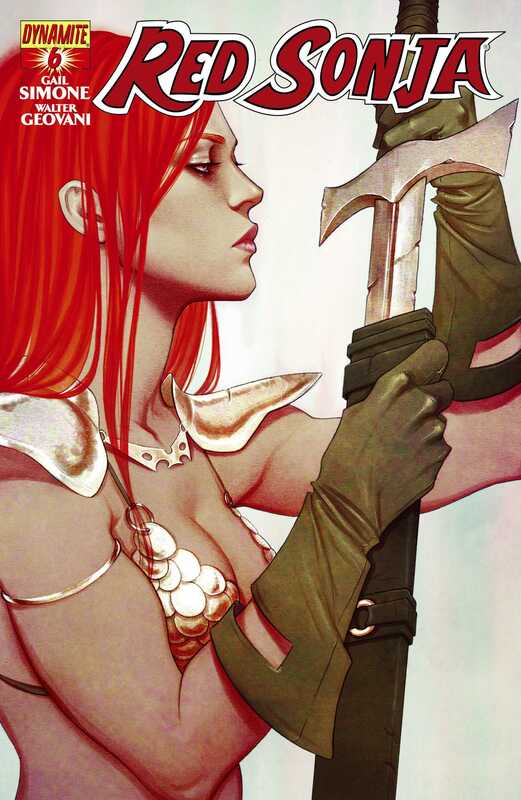 For Red Sonja, she seeks justice for the murder of Dimath and her own near-death. For another female character in this issue, she seeks justice for being made to live on the whim of a cruel tyrant. Some characters rely on their strength to see them through the day, while others rely on their mind. That’s what’s so great about this issue, because it isn’t something that has ever been so prominent in all the Red Sonja comics I’ve read to date. With the end of the arc, Gail brings everything to a satisfying conclusion and ties up all the loose ends. From start to finish this arc has been rather tightly plotted without any real dedicated meandering subplots. Everything has tied into each other until they created a larger whole, and this issue is an example of that. Whether it is the two girls Nias and Ayla that we talk about, or Annisia or even Sonja herself, they all get a closure to their stories as we’ve seen them unfold across five previous issues. What’s really great about Gail is that her endings are never absolute and that they open some room for negotiation for future stories. While you do get the sense that the current arc/story has ended, there is enough built-in leeway that things can be revisited in some shape or form in the future. Given where Sonja’s story ends here, and where its come in six issues, I’m expecting the next issue in January to be a great start to a new arc. And the defining thing is that Gail’s writing is simple and effective as always. She has a few frills and a few flashes in her writing, but they are never at the expense of the script, which is powerful as always, especially when Annisia gets her closure with all the ghosts who’ve been driving her own all these years. Walter Geovani’s pencils and Adriano Lucas’ colours are on point and quite pleasing as always. The action scenes, the splash pages, everything clicks together seamlessly and there is no change in the fact that the art on this book has been phenomenal to date, whether we talk about the internal artwork or the covers. Jenny Frison’s main cover is fantastic as usual, as is the variant cover by Jill Thompson. In all, the splash page with the big fight between Annisia and Sonja is perhaps the best page of the entire comic, especially since it includes little box-outs that recap the history between the two women. So yes, Gail, Walter and Adriano are on top form here as usual and they close out the first arc rather spectacularly, with a double death, the latter involving a cursory beheading no less. More Red Sonja: #1, #2, #3, #4, #5 (Legends of Red Sonja) #1. Posted on December 22, 2013, in Comics Reviews, Review Central and tagged Adriano Lucas, Becky Cloonan, Comics, Comics Review, Dark Annisia, Dynamite Entertainment, Fantasy, Gail Simone, Jenny Frison, Red Annisia, Red Sonja, Review Central, She-Devil With A Sword, Simon Bowland, Stephanie Buscema, Swords and Sorcery, Walter Geovani, Warrior Women. Bookmark the permalink. 15 Comments.